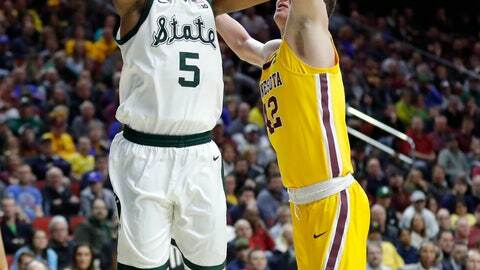 DES MOINES, Iowa (AP) — Michigan State doesn’t just hope to get to the Sweet 16 each year. It expects it. Minnesota (23-14) never found its shooting touch and was hamstrung by Murphy’s absence. The Gophers’ No. 1 all-time rebounder and No. 2 scorer hurt his back late in the first-round win over Louisville, and he spent most of the game behind the bench stretching. The game was the first meeting of Big Ten teams in the tournament since 2000 and at the earliest point ever. The Spartans hope this dominating performance lets them move on from the enduring image of Thursday’s game: Izzo coming onto the court to berate aron Henry at a timeout and then having players hold him back as he went after the freshman again on the bench. Minnesota: The Gophers’ lack of depth caught up to them. Not only was Murphy out for all but four minutes, they also were without two reserve big men: Matz Stockman for the third game in a row because of a concussion and Eric Curry for the seventh straight game because of a foot injury. Murphy’s career came to a tearful end. The senior from San Antonio never missed a game in his career, not even a practice until Friday. He subbed in for 10 seconds in the final two minutes. Gophers fans chanted his name as he came out and went down the bench hugging coaches and teammates with tears in his eyes.